Welcome to Five Foot Fitness! I originally created Five Foot Fitness to provide online videos on YouTube for people to workout at home on their own time...in their P.J's if they wish! 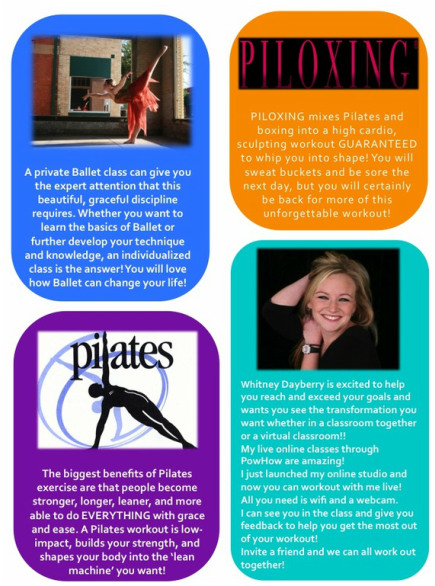 You can now take a LIVE ONLINE class with me too! It's a fantastic concept which allows us to meet face-to-face, but miles apart! There are no more excuses not to workout with me!! Anyone can follow my workouts which build strength, along with toning muscle to be long and lean, and increasing endurance and flexibility! Give one of my live online classes a whirl..who knows? It might be what you've been dreaming about! Visit me on YouTube for some quick, awesome workouts that are sure to challenge every fitness level! Follow me on Facebook for great recipe ideas, workout inspiration, and other healthy lifestyle tips! and request what works best for you! DO PRIVATE SESSIONS AS WELL...all you have to do is ASK! !